There is a first for everything , they say. I met the two Tri Edge coaches, Michael and Scott, for the first time when I attended the multi-sport simulation while preparing for my first triathlon race. They told me about a Kiwi rower, Hamish Carter, who transited from rowing to triathlon and won an Olympic gold medal in the latter sport. He was considered too small for rowing. I’m not saying I’m keen to go elite in triathlon but it’s interesting to know that rowers are able to transit into another sport and excel in it. 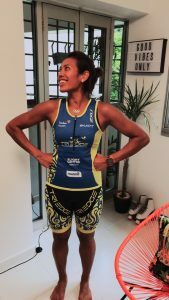 Like Helen Golver who’s practically like the world’s best female rower and went into triathlon “for fun” only to find herself qualifying for the Ironman 70.3 World Champsionships. And like Hamish Bond who is a 2 times Olympic gold medalist and 6 times World Champion in rowing and now New Zealand’s 3rd best cyclist. Maybe I’m just way too curious to find out how I would fair in other sports. Because you won’t know if you don’t try, right? Got my first dose of training programme- filled with 75mins-90mins runs, 180mins bike rides and 3km swims. They may sound normal to a regular triathlete but to someone who does 60mins runs and 90mins bike rides (max) for cross-training, I’d say goodbye to bulky muscles and hello to skinny bean. ?